Corn is so easily recognizable by most people that it doesn't beg for much of a description. The corn plant has a pithy nodded stalk supported by prop roots. The staminate (male) flowers form the tassel at the top of the plant. The pistillate (female) flowers are the kernels on the cob, which is enclosed by a leafy husk. Beyond this extend threadlike styles and stigmas or corn silk which catch the pollen. The entire plant with its ornamental tassel and ears has been a motif of American art since colonial times. Corn silk is a soothing, relaxing diuretic and a wonderful remedy for acute inflammation and irritation of the genito-urinary system, such as cystitis, urethritis and prostatitis. Corn silk is particularly useful for calming bladder irritation and infection in children. Corn silk clears toxins, catarrh, deposits and irritants out of the kidneys and bladder, and has a gentle antiseptic and healing action. Corn silk makes a good remedy for frequency of urination and bedwetting due to irritation or weakness of the urinary system, and has been used for urinary stones and gravel. By reducing fluid retention in the body, corn silk may help reduce blood pressure, and by aiding elimination of toxins and wastes from the body corn silk may relieve gout and arthritis, and act as a gentle detoxifying remedy. Traditional herb - Corn meal has been used by Native Americans for a wide range of ailments. It makes an effective poultice and has been used in Mayan, Incan, and American folk medicine to treat bruises, swellings, sores, boils, and similar conditions. Vogel in American Indian Medicine (1970) stated that "the Chickasaw Indians treated itching skin, followed by sores when scratched, by burning old corncobs and holding the affected part over the smoke." Urinary remedy - Partly due to its significant potassium content, corn silk is a useful diuretic for almost all problems of the urinary system. Corn silk soothes and relaxes the lining of the urinary tubules and bladder, relieving irritation and improving urine flow and elimination. Corn silk is also helpful for frequent urination caused by irritation of the bladder and urethral walls, and for difficulty in passing urine such as in prostate disorders. Kidney stones - Corn silk is thought to have a beneficial effect on the kidneys, reducing kidney stone formation and relieving some of the symptoms of existing stones. Cystitis - Chronic cystitis can be relieved with corn silk and and it is a useful adjunct to other treatments for acute cystitis. Gonorrhea - Naturopaths have used corn silk tea in the treatment of Gonorrhea and all catarrhal conditions of the urinary passage. Chinese remedy - In China, corn silk is used to treat fluid retention and jaundice. Other medical uses - Temporomandibular joint syndrome or disorder TMJ (TMD). Cultivated almost universally as a food crop, corn is native to the Andes and Central America, possibly originating in Peru. 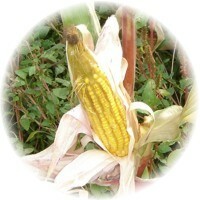 Corn silk is propagated from seed in spring. The corn silk is harvested with the ripe cob in summer, then separated and dried. Bile production - Corn silk is thought to stimulate production of bile, improving its flow from the liver through the bile ducts. Circulatory remedy - Research in China indicates that corn silk lowers blood pressure and reduces blood-clotting time. It also has moderate amounts of Iron, Zinc, Potassium, Calcium, Magnesium and Phosphorus..
Use corn silk as an infusion, fresh or dried. In urinary tract infections, take 1 cup, 200 ml (8 fl oz) three times a day. Use a decoction of the meal as a poultice for wounds and sores. As a tincture take 3 ml (50 drops) three times a day for conditions such as cystitis. The Chinese dosage is 15 - 30 g (3/4 - 1 1/2 oz). Corn silk works mainly in the urinary tract. The saponins largely act as an anti-inflammatory in the body and the allantoin as a healing agent, with the mucilage giving a demulcent or soothing effect to irritated tissues. The potassium balances out the diuretic effect of the herb, which is used in conditions of water retention. Their combined action is useful for a number of urinary tract conditions, such as cystitis and prostatitis. Vitamin K is a fat soluble vitamin that is essential for blood clotting within the body. We will help set you up to do this charitable work.